STOLEN VALOR HOME … Was this a con from the outset by this couple to get a new home bought and paid for? Homes for Our Troops, a non-profit organization, provided military veteran Army Specialist Justin Perez-Gorda a home free of charge to account for his handicap and paralysis; however, something fishy appears to be going on … within weeks after Justin Perez-Gorda and his wife moved into the home, he was walking. Miracle or fraud? I will opt for the latter. 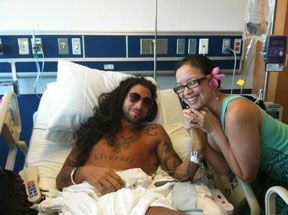 When confronted by the media of his miraculous recovery, Justin Perez-Gorda told the reporter to get off his property. The non-profit, Homes for Our Troops said the organization is thinking about its next steps and has to weigh their options. One of them might be trying to take back the home. The man suffered a brain injury in Afghanistan in 2011, but for years he and his wife claimed that he was paralyzed form the waist down. “He has permanent loss of use of both lower extremities. He’s paralyzed from the belly button down,” Josephine Perez-Gorda said in a Homes for Our Troops promotional video. But, soon after the couple moved into the house specially designed for a handicapped individual, neighbors noticed something odd: Perez-Gorda could walk. Those who spoke to WTSP said the couple became angry when asked about his condition. ‘Paralyzed’ veteran given free home caught walking. Homes for Our Troops (HFOT) is a privately funded 501(c) (3) nonprofit organization building specially adapted, mortgage-free homes nationwide for the most severely injured Veterans from Iraq and Afghanistan. If this is a fraud, which it really appears to be, it is disgusting. With so many soldiers returning from war in Iraq and Afghanistan that are truly needing of such homes, for one of their own to perpetrate such a con is just unconscionable. There is no doubt that Army Specialist Justin Perez-Gorda suffered some type of injury, but it was nothing like what was embellished. Watch the promotional VIDEO below from Homes for Our Troops and you can plainly hear Justin’s wife, Josephine Perez-Gorda, say at the 1:35 minute mark that he has permanent loss of the use of both lower extremities and that he was paralyzed from the belly-button down. Hmm, that is a far cry from the VIDEO above where Justin can be seen walking and carrying wood. Army SPC Justin Perez-Gorda was on his first deployment when he became a paraplegic and suffered a traumatic brain injury, as the result of an IED explosion in Memlah, Afghanistan on January 5, 2011. WHAT DOES HILLARY CLINTON HAVE AGAINST PEOPLE IN WHEEL CHAIRS? First the Hillary Clinton’s Scoobie van is parked in a handicapped parking spot illegally and now she cruises right past people, some in wheelchairs that were there to meet her in Iowa. Hillary’s meet and greet the little people turns out to be total BS as she wound up driving right by the so-called every day Americans that she told us all that she wanted to meet on this van tour. Imagine that, Hillary lied again. Just curious, how is Hillary Clinton supposed to be the champion of the common folk if she cant find time to meet with them? Washington Free Beacon – Reporter: Hillary’s Van Drove Past Elderly People in Wheelchairs Waiting to Talk to Her. Hillary Clinton wants to meet “everyday Americans” so badly, she drove right past many waiting in front of her event in Iowa. In the now-viral clip of reporters chasing after Clinton’s “Scooby” van, the Clinton camp drove to the back entrance, surprising both reporters and many of her supporters waiting to get a glimpse of the candidate. The news that Clinton symbolically drove past ordinary voters while driving their own “everyday Americans” to the event will certainly reflect poorly on the campaign. The incident draws parallels to the man Clinton hopes to succeed in the Oval Office when he drove past disabled veterans in Phoenix. ABOVE THE LAW: Hillary Clinton’s Mystery Machine Scooby Van Illegally Parked in Handicap Parking Spot … But What Difference Does It Make? ARE REAL AMERICANS ALLOWED TO PARK IN HANDICAPPED PARKING SPOTS WITHOUT HANDICAPPED STICKERS … IF HILLARY WAS A REPUBLICAN THE MSM WOULD BE ASKING … WHY DOES HILLARY CLINTON THINK SO LITTLE OF THE HANDICAPPED? Add another black mark to the Hillary Clinton roll out of her 2016 presidential run. This time it was in Council Bluffs, Iowa where Hillary’s Scooby Doo van parked in a handicapped parking spot. Remember, the rules really don’t apply to Democrat politicians, especially Hillary Clinton. So this is how she shows she is one of us? Do any of you think that there would not be a ticket on your vehicle if you had done the same? That’s because you are not entitled and above the law. How about a comment from Team Hillary where they they are asked whether they think its OK to park in a handicap spot and why they think so little of the handicapped that they would illegally park in a spot? Hillary Clinton’s now-famous Scooby Doo van made an appearance in Council Bluffs, Iowa on Thursday for a closed-door meeting with state Democratic Party officials – and it idled in a handicapped parking space from beginning to end. Footage broadcast by KETV-7 in the nearby city of Omaha, Nebraska, showed the presidential nominee emerging from a cafe, greeting onlookers and walking past the blue handicapped-parking sign to climb into the vehicle. Hot Air opines, Exit question: Do we, as a people, deserve Hillary? What if the answer is … yes? Kanye West said to stand up … SM says to Kanye West, SHUT UP!!! In a concert in Australia, this arrogant, egotistical stopped his concert and said he would not continue. even pressuring two individuals that were in wheelchairs. But once West’s minions gave the okay and confirmed that they were in a wheel chair, he went on with what passes for music these days. Wow, how big of you Kanya. Why does anyone give this no talent, narcissist any of their hard earned money is beyond me. A village is missing their idiot. Kanye West said to stand up! The outspoken rapper demanded his fans get up out of their seats during his show at Qantas Credit Union Arena in Sydney, Australia Friday night. When West noticed that there were a few fans still seated, he halted the show until they also obliged. Turns out one or maybe two of the fans still seated were in fact in wheelchairs. It’s unclear from the YouTube video posted Saturday how many disabled concertgoers were there, but West asked the audience to confirm that they could not get up.